Winter is just around the corner and both new and experienced drivers will benefit from taking steps to winterize their cars. The best time to winterize your car is before the first frost, but oftentimes drivers wait until after the first major snowfall, which oftentimes is too late. At Top Driver driving school we encourage drivers to be prepared by making use of the following winter driving preparedness driving tips. Prepare your car – There are a variety of things you should check or swap out on your car as you transition from summer to winter. Depending on where you live and the type of car you have different steps need to be taken. It’s always best to err on the side of caution fully winterize your car since it’s hard to tell what Mother Nature has in store for the winter. Fill up your windshield wiper fluid and replace your windshield wipers. It’s hard enough to see in the winter due to weather, so don’t make it any harder by driving with a dirty windshield. There are even special winter snow blade windshield wipers you might want to consider. Your first defense against icy roads are your tires, so it’s very important to check your tire pressure and the trend on the tires to ensure they are safe for winter. 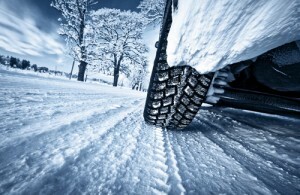 If you have special winter tires make sure to swap to them as well. Consider getting a tune-up if you haven’t had one in a while. A mechanic can check the hoses, brakes, exhaust system and car battery to make sure they are all in tip-top shape, which will help to decrease the risk of breaking down during the winter. Get an oil change and if you live in an area where it gets below freezing consider swapping to a thinner oil since the colder temperatures will affect the internal running temperatures. Check your antifreeze to make sure you have a 50 / 50 ratio of antifreeze and water. For ease you can purchase pre-mixed containers of water and antifreeze. This entry was posted in Top Driver Blog and tagged Car Safety, Cars, Driving, Driving Classes, Emergency Kit, How To, Road - Side Emergency Kit, Road Safety, Safety Tips, Tips, Winter Driving.